NOTE: This content is old - Published: Saturday, Jun 2nd, 2018. 09:10am – All lanes are clear and recovery completed on the #M56 westbound J15 and #A494 near #EllesmerePort following a collision. 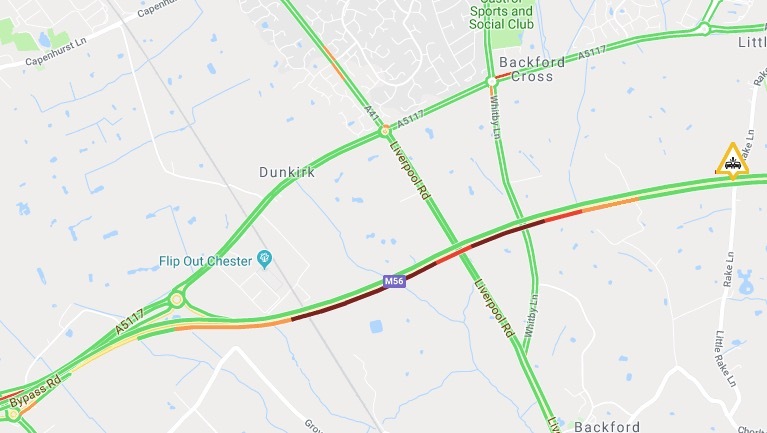 8.30am – Traffic is down to one lane on the M56 westbound J15 and A494 near Dunkirk due to a collision. Police and Highway Agency crews are at scene and are in the process of moving the vehicles involved to the hard shoulder. There are some delays and traffic is stretching back to the M53 junction.